The Shame in Ryan’s Plan or How the GOP Wants to Stick it to Seniors. Under the House Republican plan, the government holds fixed the amount of money it’s willing to pay per patient per year, and leaves the residual costs for seniors to sort out with private insurers. Because private insurers are smaller, profit-driven, and less efficient than Medicare, those out-of-pocket costs will be significantly higher than they are now. And they’d grow much, much faster. Over the course of the program’s 75 year planning period, the difference would amount to $34 trillion. And while they are trying to take away the Medicare you paid for all your working lives, the GOP is still trying to repeal or defund the Affordable Care Act, where the new health care laws were put into place to stop the health insurance industry from some of its more pernicious acts against sick people. The GOP wants to get rid of the new health care law with its consumer protections; high risk pool for those with pre-existing conditions, relief for seniors who hit the donut hole, allowing your children to remain on your policy until they are 26 years old, eliminating yearly and lifetime caps on your benefits, to name but a few of its many benefits. See how your Congressional rep voted on the Ryan Plan here with an interactive map from the New York Times. About 1 percent of all Americans are millionaires. In Congress, that number regularly hovers between 40 percent and 50 percent, meaning elected leaders generally need not worry about the economic pressures many Americans face – from securing gainful employment to grappling with keeping a family financially afloat. Decide for yourself if these congressional millionaires are adequately representing your financial interests. Vermont now leads the way in our nation on health care! Vermont is now leading the way in our nation towards a civilized, rational and cost-effective form of health care. The state has passed a bill establishing a Single Payer system. That’s right, everyone in the state of Vermont will have the right of health insurance coverage, a Medicare for Everyone type of health care. Imagine, if you will, the security of never fearing you are just one pink slip away from a health care related financial disaster or knowing that you will not have to declare bankruptcy if you lose your job and have a pre-existing condition like Multiple Sclerosis. You will always be able to pay into a Single Payer system and be covered. And the more people in the pool, the more costs are contained. 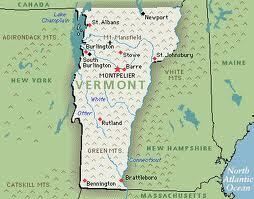 Here’s Vermont for Single Payer dot org’s Top 10 Reasons for the Single Payer system. A bigger hurdle Vermont faces is obtaining a waiver from the federal health care reform act and finding a way around federal ERISA laws — which “pre-empt states from enacting legislation if it is ‘related to’ employee benefit plans” –- that insurers could use to sue the state. The health reform law currently offers a waiver to states who meet certain standards by 2017. Rep. Peter Welch (D-VT) has introduced an amendment that would move the waiver date up to 2014 — an idea that President Obama has endorsed. For those of you unfamiliar with ERISA laws, be glad you are. The federal ERISA (Employee Retirement Incoms Security Act) laws were in enacted in 1974 and meant to protect employees from having their pension funds ravaged by crooked CEOs. It also covers health plans and there’s the problem. More on ERISA here, here and here. Please read these links, they explain everything in detail. The health insurance companies like ERISA laws since it helps them NOT pay out claims or holds them liable for any wrong-doing. It’s why Nataline Sarkisyan’s parents could not sue CIGNA when they denied their 17 year old daughter a liver transplant and she died. Nataline had leukemia. During the debate over the Affordable Care Act two specifics were brought to the table to help the consumer. The first was get rid of ERISA for health plans. Guess what? The insurance lobby (AHIP) won on that one and we still have it. And the second was get rid of the McCarran Ferguson Act of 1945, the one where the insurance industry is immune to Federal Anti-Trust Laws (like Major League Baseball). You guessed it, the insurance lobby won out again over the consumer. If you are a believer in states’ rights then I urge you to write your members of Congress and tell them to do away with these two federal laws and put the rights back in the hands of your state. You’ll be healthier! And Single Payer or Medicare for Everyone. If the deficit really matters, then it’s time for Medicare for Everyone. Back during the health-care reform fight, the Congressional Budget Office looked at the likely effect of adding a public option that paid Medicare rates. “In total, a public plan based on Medicare rates would save $110 billion over 10 years,” the agency concluded. Importantly, the savings would come because premiums would be lower. The basic mechanism here is not complicated: Just as you get better deals by shopping at a mega-retailer like Wal-Mart, you get better deals by working with a mega-insurer like Medicare. Size matters. As for Ryan’s plan, CBO’s take was just the opposite. “Under the proposal,” they said, “most elderly people would pay more for their health care than they would pay under the current Medicare system.” That is to say, health-care costs go up. Erratum: In the original posting below, I stated that under the Ryan plan, seniors would receive $6,000 voucher to help with purchasing insurance. This is incorrect. The correct figure is $8,000 for the year or roughly $666 per month to pay your premiums, co-pays and pharmacy charges. Link to full map of all Congressional reps who voted on the Ryan plan below. List of California reps who voted to abolish Medicare at bottom of posting. As this Foundation has noted before, Rep. Paul Ryan’s budget plan calls for abolishing Medicare to all those under the age of 55 and handing your taxpayer money over to private corporations. What happens to all the money you have been paying into Medicare for the past 30+ years of your working lives? Answer is you get nothing in return. This Foundation began in part because of the way my husband, who has Progressive-Relapsing Multiple Sclerosis, was treated by his insurance carrier, CIGNA, a private, for-profit corporation with a long and terrible history of denying claims to their sick, premium paying customers–one such denial resulted in the death of 17 year old Nataline Sarkisyan. Rep. Ryan and all his GOP friends want to hand you a voucher for $6,000 and tell you to go and find a company, like CIGNA, who will insure you at the age of 65, for that amount of money–while at the same time they, the GOP, are trying to undo the Affordable Care Act that will prevent insurance companies from denying your claims. Doesn’t make one bit of sense, does it? If you have Multiple Sclerosis or any other life-altering disease, you know how far $6,000 will get you. If you have MS, that’s the cost of your disease modifying drugs for just one month! Call your representative if they voted to abolish Medicare. Tell them forget trying to get re-elected since they don’t seem to be serving the American public but their corporate paymasters instead. Contact information is embedded in each link and the full map of how Congress voted can be found at the New York Times. It’s time this country went to a single payer system. Medicare for Everyone, cradle to grave. Call and be heard. It’s your money that pays for Medicare and pays for Congressional salaries. Remember, they work for us. 1. Rep. Herger, Walter [R-CA2] voted to abolish Medicare. 2. Rep. Lungren, Daniel [R-CA3] voted to abolish Medicare. 3. Rep. McClintock, Tom [R-CA4] voted to abolish Medicare. 4. Rep. Denham, Jeff [R-CA19] voted to abolish Medicare. 5. Rep. Nunes, Devin [R-CA21] voted to abolish Medicare. 6. Rep. McCarthy, Kevin [R-CA22] voted to abolish Medicare. 7. Rep. Gallegly, Elton [R-CA24] voted to abolish Medicare. 8. Rep. McKeon, Howard [R-CA25] voted to abolish Medicare. 9. Rep. Dreier, David [R-CA26] voted to abolish Medicare. 10. Rep. Royce, Edward [R-CA40] voted to abolish Medicare. 11. Rep. Lewis, Jerry [R-CA41] voted to abolish Medicare. 12. Rep. Miller, Gary [R-CA42] voted to abolish Medicare. 13. Rep. Calvert, Ken [R-CA44] voted to abolish Medicare. 14. Rep. Bono Mack, Mary [R-CA45] voted to abolish Medicare. 15. Rep. Rohrabacher, Dana [R-CA46] voted to abolish Medicare. 16. Rep. Campbell, John [R-CA48] voted to abolish Medicare. 17. Rep. Issa, Darrell [R-CA49] voted to abolish Medicare. 18. Rep. Bilbray, Brian [R-CA50] voted to abolish Medicare. 19. Rep. Hunter, Duncan [R-CA52] voted to abolish Medicare. One of the reasons this foundation started was to fight against health insurance injustices. Part of that was, and is, fighting to keep the Affordable Care Act in place and build to make it even stronger. While I will not address the various arguments and downright lies against the law, suffice to say, they have no merit and proof of that is the report Health Access dot org put together to celebrate the one year anniversary of the Affordable Care Act. Health Access was founded in 1987, and is the statewide health care consumer advocacy coalition advocating for quality, affordable health care for all Californians. My husband, Paul, is featured in the report to highlight the need for the Pre-Existing Condition Insurance Pool or high risk pool. Paul has Multiple Sclerosis. Paul was ousted from his job at Fidelity Investments just after he finished chemotherapy. A year without income left us unable to afford our COBRA payments. Paul is without insurance. Going without insurance when you are sick is what happens in this country. It kills people and burdens our system. Paul has been without care for five months now, was turned down for coverage by Blue of California and must wait one more month before he can even apply to the new high risk pool. Yes, there is a bizarre and draconian provision in the new law (thanks to the Senate Finance Committee) that states applicants to the pool must go without insurance for six months prior to applying for coverage. It does not make any sense at all and we have been doing everything we can to call attention to this issue and have asked our lawmakers to simply change this. Truthout dot org ran a story on this very issue and called on our lawmakers to rid the law of this provision. But our lawmakers are too busy trying to do things like undermine public school teachers and defund NPR to pay attention to real matters–like the economy, health care and jobs. That would be the GOP portion of our lawmakers. When presented with facts like these below, the GOP all put their collective heads in the sand and cry something about taxes. Shameful as real Americans face real problems. Please read the report and know that we still have a long way to go, but this is a start. During those six months, these individuals could become too sick to work. They may never return to work or pay taxes again, leaving them on the unemployment and disability rolls, or they may go bankrupt or have foreclosed homes: three problems that we know are already bedeviling our economy. These are very real possibilities, because an astounding 62 percent of bankruptcies and 23 percent of foreclosures in this country are due to medical bills. Make no mistake about it, GOP’s Rep. Paul Ryan wants to take your money and give you nothing in return. Part of the efforts of this Foundation include the push for Medicare for Everyone in this country, from cradle to grave. But Rep. Paul Ryan wants to take away the system that seniors have paid for all their working lives, Medicare. The private, for-profit system of health insurance has gone unchecked in our country for 60 years now and we have nothing but skyrocketing costs and a system that is ranked 37th in the world. The Affordable Care Act, President Obama’s much demonized by the GOP plan, has been the only thing to come along and attempt to make the private health insurance companies pay when you get sick; not rescind your policy, not tell you that your cancer treatment is too expensive, not deny you a transplant, actually pay your medical bills since they collect your premium dollars. And we all get sick, some more than others, like waking up one day as my husband did and not being able to feel his legs. And now along comes GOP congressman, Paul Ryan from Wisconsin. Rep. Ryan has been in Congress since 1998. If you are curious as to his pension and benefits (he does hail from Wisconsin) Ryan became fully vested after a mere five years of service (it’s one of the perks of being a freely elected member of Congress) and Rep. Ryan will leave Congress with a taxpayer funded pension–we do pay his salary as he is a public servant! 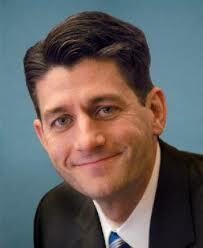 Rep. Ryan’s net worth can be found at Open Secrets dot org and here is the link. But I don’t see Rep. Ryan going on about his own pension, just things like Medicare and Social Security, two programs seniors in our country have 1. paid for, 2. need for their own retirement and 3. are programs indicative of a civilized society. Keep reading. Appearing on MSNBC’s “Morning Joe” program the morning of Feb. 17, 2011, U.S. Rep. Paul Ryan, R-Wis., defended Walker’s efforts to force public employees to pay more in pension and health care costs to solve the state’s budget deficit. That’s interesting as Rep. Ryan is in public (not private) service himself and we the people will be paying his pension. Period. We pay our public servants’ salaries, subsidize their wonderful health benefits program and pay their pensions when they retire. It was created under the Reagan presidency and is called the Federal Employees Retirement System. Lawmakers with less service qualify for full pension benefits starting at age 62. The retirement package includes automatic inflation adjustments and guaranteed access to post-retirement private medical insurance in addition to Medicare protection provided all Americans. Barely 20 percent of the American workforce has pensions comparable to congressional pensions, according to the independent Employee Benefit Research Institute. Almost no one in the private sector has the kind of cost-of-living escalators that keep Capitol Hill pensions moving upward. That is in total disagreement with what Rep. Ryan said about private sector pensions and is what he will receive when he retires. I find that hypocritical, at best and completely uninformed of him. Now let’s look at Rep. Ryan’s campaign donors. From OpenSecrets.org we find that Rep. Ryan’s top contributor was the faux industry called Retired. This is not the AARP, who if you recall, were in favor of The Affordable Care Act. This Retired industry is something entirely different. These are high net worth individuals. His other top donors were insurance companies, money movers like Harris Associates, Big Pharma and of course, Koch Industries. 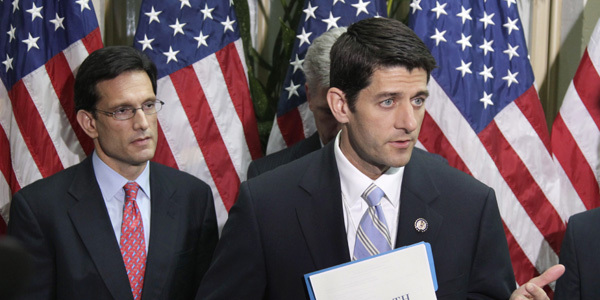 So what does Rep. Ryan want to do to “balance the budget?” Let’s face it, we have money in this country. We printed it to bail out the banks (Rep. Ryan voted for TARP) and we are in two incredibly expensive wars (Rep. Ryan voted yes to invade Iraq but won’t put military budget cuts on the table but will cut veteran’s benefits), so tell me why would we have to undermine our own well-being? Because people like Rep. Ryan are beholden to their corporate paymasters. Rep. Ryan’s less than stellar voting record is here. No to health care, no to unemployment benefits extension, no to fund Planned Parenthood (unwanted pregnancies can be avoided with contraception, Paul), no to aid to states for Medicaid and teachers and no to food safety regulations. He’s a regular GOP No to everything kind of guy–except when it comes to attempting to take your money away from you and handing it over to his buddies. Rep. Ryan wants to take your money and give it to his corporate friends. He wants to privatize Medicare. That’s your money. Medicare works beautifully as it is (although there is always room for improvement) and you pay into it–it’s your money–and he wants to hand it over to who? The private health insurance companies? Those same upstanding corporate citizens who denied 5 year old Kyler Van Nocker his cancer treatment? Kyler never saw his 6th birthday. And he wants to raise the retirement age (while undermining your health care) and give out vouchers for your Social Security dollars, so you can give them to the reckless fools (his campaign donors) who got us into this financial mess in the first place: Wall Street. Ryan has been calling for big changes to the social safety net for years. Known as “the roadmap,” his approach calls for individuals to take on more of the financial responsibility for retirement, including the costs of health care. The government would provide a floor of protection for everyone, particularly the poor and those in failing health, but middle-class people who desire more than a basic plan would have to pay extra. He’s also proposed allowing younger workers to divert part of their Social Security taxes to personal investment accounts, an idea that’s lost currency among other Republicans given President George W. Bush’s failed 2005 Social Security overhaul and the recent swoon in the stock market. The plan Ryan rolled out last year for Social Security would gradually increase the full retirement age, from 67 to 70. It would also reduce initial benefits for middle- and high-income retirees. Under the roadmap, Medicare would be converted into a voucher system that offers seniors a fixed payment to pick their coverage from a range of private insurance plans overseen by the government. Today’s Medicare recipients and those nearing retirement would remain under the current system, in which the government determines what’s covered and sets payments for providers. We cannot stand by and allow our money, our tax dollars, to be given to private corporations who pay little or no taxes themselves. This kind of power grab will ultimately make us, as a country, less stable and less healthy. Our social safety nets are ones we pay for and to give away our tax money to companies who have no other interest than their bottom lines (much like the for-profit health insurance industry) will be our undoing. They will give us less and less for each dollar we give them. It’s a power grab to attempt to take away our government and create a large corporate bureaucracy where We the People will have no say in how our lives, our health and our money are handled. Here is Rep. Ryan’s contact information. Tell him to stop the power grab. Tell Wisconsin voters we don’t agree. What repeal of health care would mean, by congressional district. Today Rep. Henry A. Waxman, Ranking Member of the Committee on Energy and Commerce, and Rep. Frank Pallone released, for each congressional district and the 30 largest metropolitan areas, an analysis of the impact of the repeal of patients’ rights, protections, and benefits contained in the historic health care reform law. Click on the highlighted text to be taken to the Committee’s website. There you will find a map with all the states broken down into their districts with each representative’s name. The numbers of people the Affordable Care Act would help, and are helping, speak for themselves.